(Nanowerk News) Leica Microsystems is introducing a new pulsed 775 nm STED laser with the super-resolution system Leica TCS SP8 STED 3X, which achieves sub 30 nm resolution through pulsed stimulated emission depletion technology. The laser is an optional enhancement to the system and will be shown for the first time at the European Light Microscopy Initiative (ELMI) meeting in Oslo, Norway, May 20 to 23, 2014. 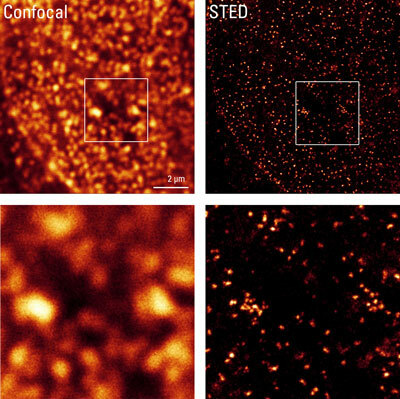 Immunostained nuclear pore complexes in HeLa cells (NUP153-ATTO 647N) illustrate the resolution enhancement achieved with Leica TCS SP8 STED 3X and the 775 nm pulsed STED laser (right images) compared to the resolution achieved with confocal microscopy (left images). The Leica TCS SP8 STED 3X is the latest generation of super-resolution microscopes from Leica Microsystems, based on stimulated emission depletion (STED) technology. The super-resolution microscope system is flexible and versatile, and allows researchers to tune resolution in the lateral as well as the axial direction. The 775 nm pulsed STED laser is the most recent addition to the range of multiple STED lasers of different wavelengths. This new pused laser leads to a further increase in the resolution capacitiy of the Leica TCS SP8 STED 3X, revealing details in multicolor colocalization experiments that have never been seen before. The Leica TCS SP8 STED 3X is based on the modular platform Leica TCS SP8. “The Leica TCS SP8 STED 3X is one example of Leica Microsystems’ steady continuation of its pioneering super-resolution developments over the last 10 years,” says Dr. Dietmar Gnass, Director R&D at Leica Microsystems.